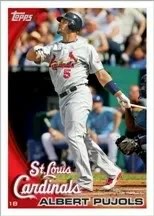 Topps Trading Card Company will be the exclusive maker of MLB baseball cards starting in 2010. 2010 Topps Series 1 Baseball features a total new look. The Albert Pujols and David Wright 2010 Topps Baseball image is courtesy of Topps Official Website. This year features the robust set we have known to love, plus some nice surprises like Jumbo Peak Performance Jersey Cards and Mickey Mantle Cut Autograph Cards. There are many SP Base Cards (seen below) including Abe Lincoln cameos and the New York Yankees Pie In The Face PITF Cards are featured along with Legends and other MLB players. The set is a great start to the 2010 Baseball Season, take a look at the highlights of this years set below. There are always some surprises with Topps and this year has some Base Cards that are more difficult to find than others. Our friends over at bdj610’s Topps Baseball Card Blog has some early speculation of the SP cards in the 2010 Topps Base Set. You can see below how many copies are on eBay to see if the numbers stack up! One of the sets I am excited to see are the Jumbo Peak Performance Jersey Cards that are inserted in 2010 Topps Series 1 Baseball. The jersey pieces are big and nice. EVERY TOPPS BASE CARD EVER MADE SINCE 1952 GIVEN AWAY!!!! This is a very exciting chance to get just about any Topps Base card ever made by the company! Sure there will be lots of 1990 Topps, but you may get a 1950’s or 60’s Topps card and that would be amazing. Each time you enter a code Online you are entering for a chance to win a complete 1952 Topps Baseball set! I think this a great addition to 2010 Topps Baseball. Gold Parallel (330) #’d to 2010. Platinum Parallel (330) #’d 1 of 1. Tales of the Game (25) Quirky baseball moments Inserted 1:6.